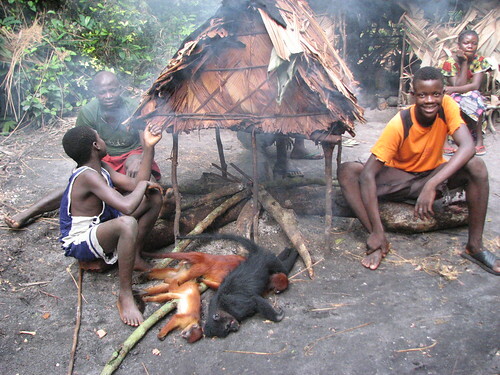 Searching for Bonobo in Congo » Ebola Empties Villages, Bushmeat Empties Forests. 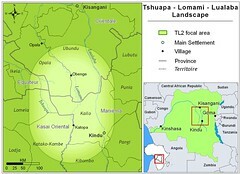 « Mbuti Exodus: from Lualaba Barge to Lomami Forest Canopy. 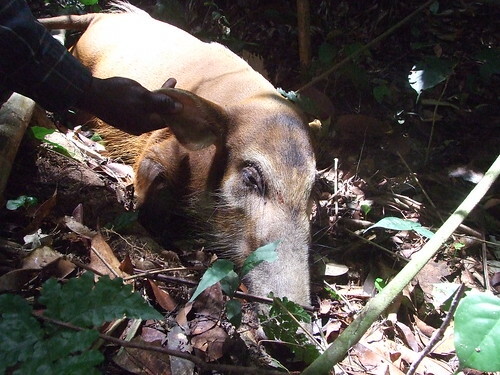 Ebola Empties Villages, Bushmeat Empties Forests. Ebola is a disease, Bushmeat is commerce, but both remain uncontrolled for similar reasons: absence – on the ground – of adequate trained, committed individuals. Why the unwillingness to marshal and train human experts – on the ground – to bring the plagues under control? For the Ebola plague, Doctors Without Borders was the first group on the ground, the month the epidemic was declared in 2014. In 2015 they still plead for Biological-Disaster Response Teams. “Thank you for the new clinics, but the clinics need staff.” The number infected is over 24,000 and rising again in early 2015. Villages will continue to empty. Small scale hunting like this – a single primate – is rarer as it becomes necessary to go farther and farther from the village to hunt successfully. 1. 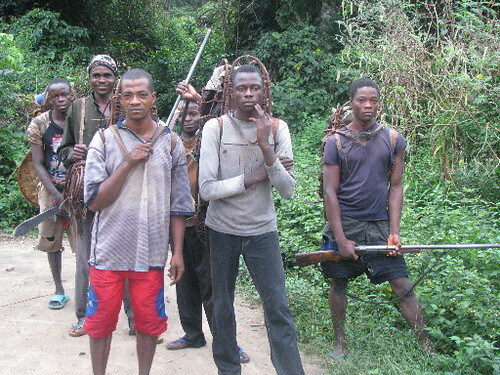 When we set out to explore the Lomami we explored over 40,000 km2 of forest; the whole outer half of it was empty and bushmeat hunters were coming towards the remaining core forest from all angles in order to stock the city bushmeat markets . 2. After Sankuru Reserve was created in November 2007, our inventories and those of WCS showed that more than 2/3 of the forest was essentially empty at the time of gazettement: no more bonobos, no more elephants, the big duikers gone, the primates few. 3. Between the first and second inventory of the Okapi Wildlife Reserve (1995 and 2006) between 40% and 60% of all species inventoried were lost; that includes elephants, chimpanzees, okapi, and duikers. 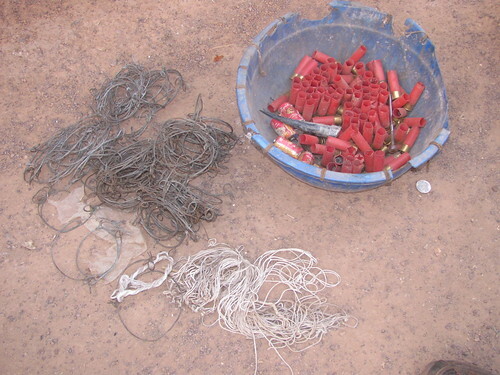 That happened inside a protected area. 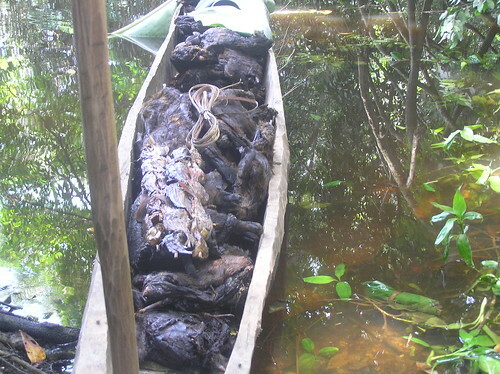 A dugout load of bushmeat secured with a pole to the Lomami River’s shore..
No law enforcement, no development of alternatives, no on-the-ground monitoring…. Where has the money (more than 4 million dollars) gone? A bicycle load of bushmeat. An obvious non-starter : how does a hunter target non-threatened species and leave all the others in peace. What does that mean on the ground? 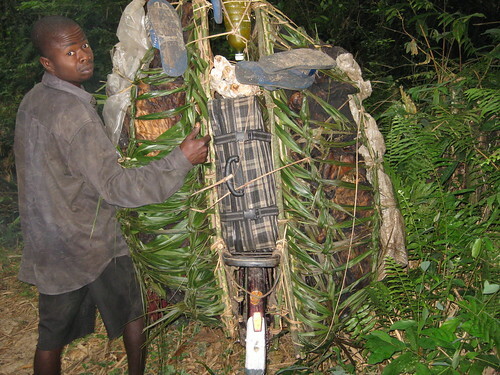 A hunter places 500 snares along snare lines in the forest. 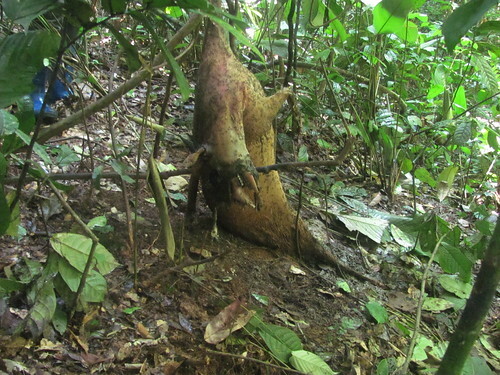 Are his traps able to capture blue duiker, but not water chevrotain? The cable or nylon does not care. And how do you create participatory wildlife management when there is almost no wildlife left to manage? cables, nylons and shells to be “reloaded” with shot. We knew one of several short-term FAO research projects associated with this GEF. 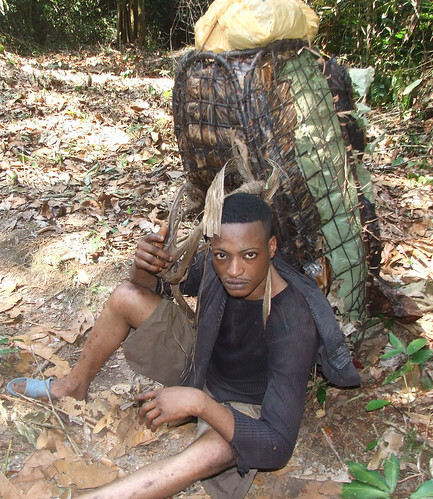 The researcher used camera traps to asses animals in the forest of a pilot village more than 100 km east of Kisangani. The cameras showed an impoverished, remnant fauna. 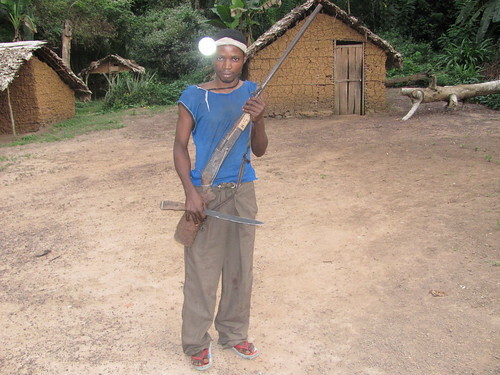 Already there were village-level problems of who had rights to what part of the forest for hunting. Not promising. A back load of bushmeat. To encourage hunting for only non-threatened species, hunters of protected species (elephants, bonobos, chimps, giant pangolins….) must be arrested, prosecuted and punished. So says the CBD recommendations above. As it stands now, this process usually does not get beyond arrest. After all, killing a bonobo or elephant is not as important as, for instance, stealing a cell phone, or sleeping with someone else’s wife, or making off with your neighbor’s goat. That bonobo or elephant did not belong to anyone else…what’s the problem? Hunting camp with drying rack. The CBD recommendations have been used to justify work, not only by FAO, but also by some universities. 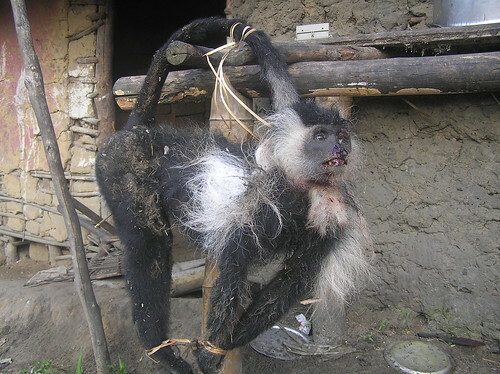 A regional database for bushmeat research in Central and West Africa has been assembled. This certainly has academic merit, but it is unlikely to reduce bushmeat hunting in any forest being hunted to near-empty. The authors’ statement that “Such information could assist decision-makers to develop evidence-based conservation strategies” fails to understand the vast separation between strategy (offices) and application (ground). The authors statement that they are complying with the CBD’s request for monitoring does not recognize that monitoring should lead to appropriate action to protect forests when they are being depleted. People (local, regional and ex-pat) are needed on the ground with the mission to make that happen. Ready for night hunting, near Bili Uere, Orientale. As a result of a lot of “forward-backward-stepwise” and “fuzzy” logic (their own terms) the authors proposed areas of potential sustainable hunting that in the eastern DR Congo includes two national parks and two reserves. There was no mention of protected areas in the paper. As mammals were discussed only at the taxonomic level of Order there was no ability to distinguish between the okapi and the bay duiker. The FAO GEF was a five-year initiative approved in 2011. It must now be at its end. I think that governments, communities, conservationists and all potential actors in the field (local, regional, expat) need to know the results and hear the proposed follow-up. When a snare line is not checked frequently enough: rot and army ants. This entry was written by Terese Hart, posted on 2015-04-28 at 10:08 pm, filed under Bushmeat. Bookmark the permalink. Follow any comments here with the RSS feed for this post. Trackbacks are closed, but you can post a comment. Thanks for this Terese and you are right, we need to know what the results and follow up will be. The empty forest phenomenon is spreading at an alarming rate. Hi Terese. This is absolutely spot on! I couldn’t agree more wholeheartedly with what you say.